With two out of three recent IPOs giving good returns, retail money is back in the market. Investment bankers say the revival is here to stay. Sirji IPO mein paise daal rahe ho na? Leverage karo. Yahi time hai paise banane ka. Listing gains confirmed hain. This is part of a conversation at the investment banking division of an Indian bank where an employee is asking a colleague to invest in initial public offerings, or IPOs, even insisting that he use borrowed money to invest and book profits the day the shares start trading in the market. It's a risky strategy but one that can be highly rewarding. And rewarding it has been. Consider this: Companies that have came out with IPOs this financial year (2016/17) have on average given 19.3 per cent returns on listing. Barring L&T Infotech and ICICI Prudential Life Insurance shares, which opened 6 per cent and 1.5 per cent lower than issue prices, respectively, all 14 IPOs since April this year have given positive returns on listing. The ICICI Prudential IPO was hit by subdued market sentiment in September as investors booked profit on fear of tensions between India and Pakistan. The biggest IPO in India in six years had helped the company raise Rs 6,056 crore. It was subscribed over 10 times. Though listing gains slightly disappointed in September, the overall bullish trend has been whetting investor appetite for months now. The 14 IPOs since April were subscribed over 32 times on average. Those of RBL Bank, Advanced Enzyme Technologies, Quess Corp, Mahanagar Gas, Thyrocare Technologies and Ujjivan Financial - which raised between Rs 400 crore and Rs 1,000 crore each - were subscribed 40 to 82 times. But the more important development has been the return of retail investors, who were on the sidelines for years after making huge losses in Reliance Power's mega IPO in early 2008. The retail portion of six IPOs - GNA Axles, Advanced Enzyme Technologies, L&T Infotech, Dilip Buildcon, SP Apparels and Quess Corp - was subscribed 11 times on average. Even the retail book of big issues, such as that of ICICI Prudential Life Insurance and RBL Bank, was subscribed 1.4 and 5.7 times, respectively. Prior to that, the retail portion of the 29 IPOs between January 2015 and June 2016 was subscribed 2.75 times. "There aren't many avenues for investors right now as returns from fixed deposits are low and the real estate market is dead. That is why we are seeing a rush towards IPOs. After all, where do you get 15-20 per cent returns in 15 days?" says Ravi Sardana, Executive Vice President, ICICI Securities. Bankers are expecting a flood of IPOs this year. "Every day at least one promoter approaches us for getting his or her company listed," says Dharmesh Mehta, Managing Director & CEO, Axis Capital. 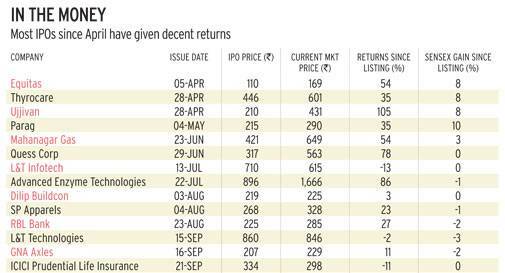 In the 18 months since April 2015, 38 companies have come out with IPOs, of which shares of 26 are trading above issue prices (See In The Money). They have delivered 30 per cent returns on average, compared to the 6 per cent rise in the Bombay Stock Exchange Sensex during the period. "The key has been pricing. We have been leaving 20-30 per cent discount for investors," says Mehta. Still, one thing has not changed. 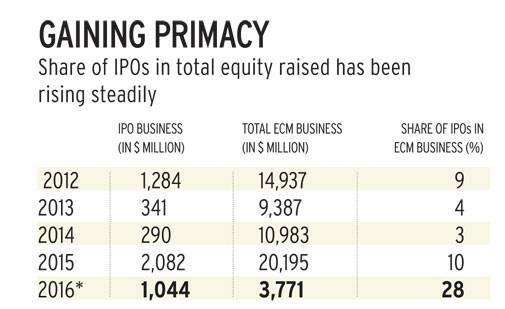 The main aim of most IPOs is either providing an exit opportunity to private equity players or retiring debt. Not many companies are raising money for expansion. India Inc., it seems, has a long way to go before it can come out of the slowdown phase. One big difference in the latest IPO rush is participation by domestic mutual funds. 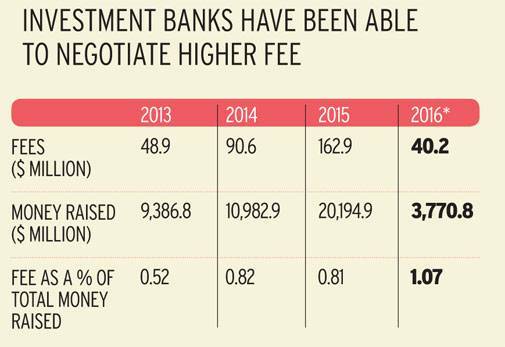 This is a welcome change from years of dominance by foreign institutional investors or FIIs. According to Prime Database, mutual fund subscription in IPOs since January 2015 has been well over two-third of the total institutional book. "Earlier, FIIs used to build momentum. This time, participation by mutual funds is a big comfort to bankers and issuers. The subscription of the anchor book by them sets the tone for participation by retail and other institutional investors," says Sardana of ICICI Securities. This has been possible due to huge inflows into mutual fund schemes over the past one year. Mutual funds' asset under management were at an all-time high of Rs 16.07 lakh crore in August, up 20.5 per cent from Rs 13.33 lakh crore a year ago. "It's a pure listing play for most of us. We are investing in IPOs to make a quick buck," the chief executive of a mutual fund says on condition of anonymity. But not all funds are investing for quick gains. Several are looking for young companies that can grow fast, as most companies that have come out with IPOs of late are in sunrise sectors. For instance, ICICI Prudential Life Insurance is India's biggest private sector life insurer, Quess Corp is an integrated human capital services provider, Equitas and Ujjivan are small finance banks, while Dr Lal Path Labs and Thyrocare Technologies operate in the high-growth diagnostics segment. "This year will be remarkable in terms of size, number and diversity of IPOs. A number of companies from sectors such as insurance, stock exchange, telecom, health care, automobile, airline and retailing want to enter the market," says Sardana of ICICI Securities. Another big change this time is the quality of companies floating the paper. "The difference between now and 2010 is that this time companies hitting the market have a sound record, are efficient with capital use, are generating positive cash flows and, most important, are in sectors that don't have huge regulatory uncertainty," says V. Jayasankar, Senior Executive Director and head of Equity Capital Markets at Kotak Investment Banking. He was hinting at real estate, infrastructure and power companies that were in the forefront of raising capital a few years ago. Shares of 80 per cent of the companies that came out with IPOs between 2005 and 2010 are trading below issue prices; 80 per cent are trading at less than 10-20 per cent of issue prices. These include GMR Infra, Bartronics, Gokaldas Exports, Reliance Power, Ramky Infra, Orient Green Power and Punj Lloyd. "We have been careful. If sentiment is not good for a sector, we are not accepting mandates for companies in that sector," says Mehta of Axis Capital. Some say Dilip Buildcon was told to postpone its IPO last year. With sentiment for the infrastructure sector improving this year, the issue sailed through smoothly; the shares rose 15 per cent on listing. "Despite the bullish sentiment and improved financials of the company, we priced it on the basis of previous year's valuation, making it attractive for investors," says a banker. Bankers are also timing the issues better. "At any point in time, the Indian market can absorb paper worth Rs 30,000-40,000 crore. We (bankers) are seeing to it that no two big issues hit the market at the same time," says Mehta. "Unlike 2007/08, markets aren't insane. Everyone is cautious about valuations and the type of companies hitting the market. When everyone is cautious, it is certain that markets aren't going to tank," he says. "We are valuing the IPOs fairly, but one has to be careful while taking a call on companies after listing. Shares of some companies have risen beyond reasonable levels and are at exorbitant price-to-earnings multiples of 40-60 times. It is advisable to stay away from such counters," says Mehta. Bankers say retail investors should bet on IPOs for listing gains. With issues getting subscribed by a big margin, investors get much less shares than what they apply for. Still, the shares issued are sufficient to earn decent returns of Rs 4,000-5,000 on an investment of Rs 15,000-20,000, they say. 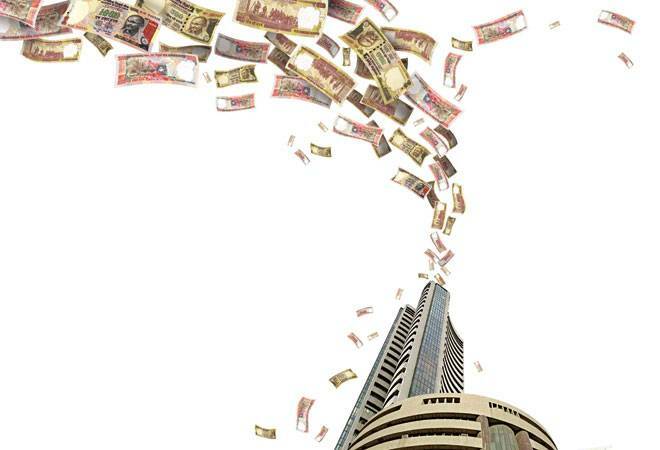 "Shares of less than 25 per cent companies that have hit the market in the past 18 months are trading below offer prices," says Sanjay Sharma, Managing Director - Head of Equity Capital Markets at Deutsche Equities India. This makes him confident that the party will go on. "My only worry is promoters and bankers getting greedy. Till the pricing is reasonable, I expect the momentum to continue," says Mehta. The rush of initial public offerings, or IPOs, means investment bankers are doing good business. They are happy that the fee market has revived. "The revival of the IPO market has led to an improvement in the fee market. The fee is now around 2.5 per cent per deal," says Samarth Jagnani, Executive Director - Head of Equity Capital Markets, Morgan Stanley. Last year, it was 1.5-2 per cent. "We are not signing deals where we are not compensated adequately. Depending on the deal size, the fee can go as high as 3.5 per cent," says Dharmesh Mehta, Managing Director & CEO at Axis Capital. He gets at least one request a day from a promoter looking to get his or her company listed. According to Thomson Reuters, in the first six months of 2016, the equity capital market (ECM) segment earned a total fee of $40.2 million for raising $3.77 billion (See table below). This is the first time in four years that the contribution from the IPO business has been the highest - around 28 per cent, as against 10 per cent in 2015. In 2012, 2013 and 2014, the figures were 9 per cent, 4 per cent and 3 per cent, respectively. The business has been dominated by Indian bankers. According to Prime Database, Kotak Mahindra and Axis Capital dominated the IPO market with market shares of 47.4 per cent and 43.6 per cent, respectively. If it would not have been for the IndiGo issue, no foreign bank would have been in the top five of the IPO league tables. "The size of the IPO matters. We (foreign bankers) don't take the mandate unless it makes business sense. The IPO has to make us money. So far, the IPOs hitting the market have been small," says Sanjay Sharma, Managing Director and Head (Equity Capital Market), Deutsche Equities. India.